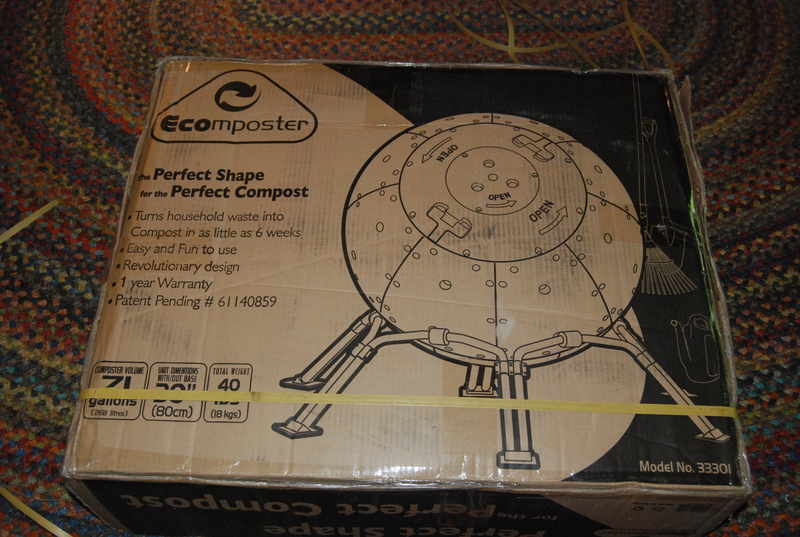 Constructing the Ecomposter was not a lot like death, despite the warnings. It came in a box. The box came from China. 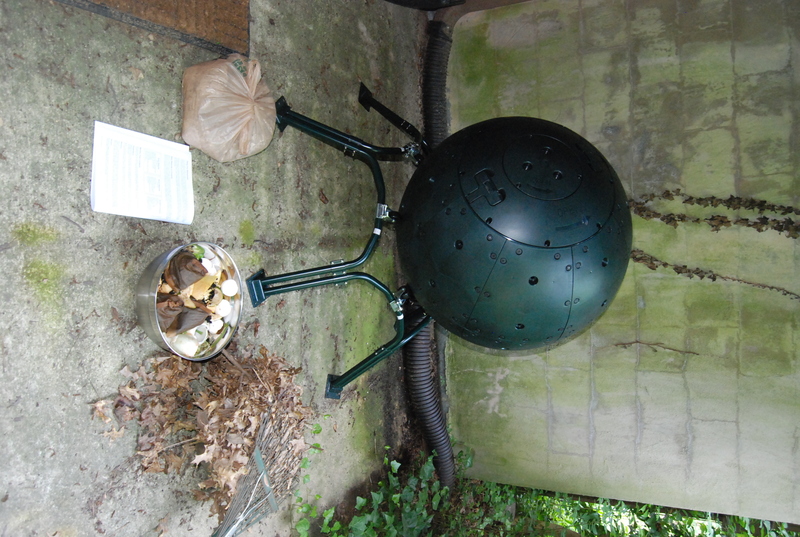 Two World Cup games after it started, the Death Star… er… Ecomposter, was ready to fill. What’s going in? From left to right, wood ashes (a “brown”), directions (not going in, but useful), a weekend’s worth of vegetable scraps, coffee grounds, and eggshells (the “greens”), and fallen leaves (another “brown”). The idea here is to mix greens and browns in a 1:1 ratio to start, then to keep a happy moisture level thereafter. Load, then spin, daily. And, keep adding until full. Then let finish. I will admit that it does not look delicious or nutritious right now. It looks like a mold pile waiting to happen, and it’s likely to get gross before it’s finished. But, provided this whole natural process works as advertised, once it’s done, my plants are going to love this stuff! The first post in the new green@home category comes straight from woot.com. 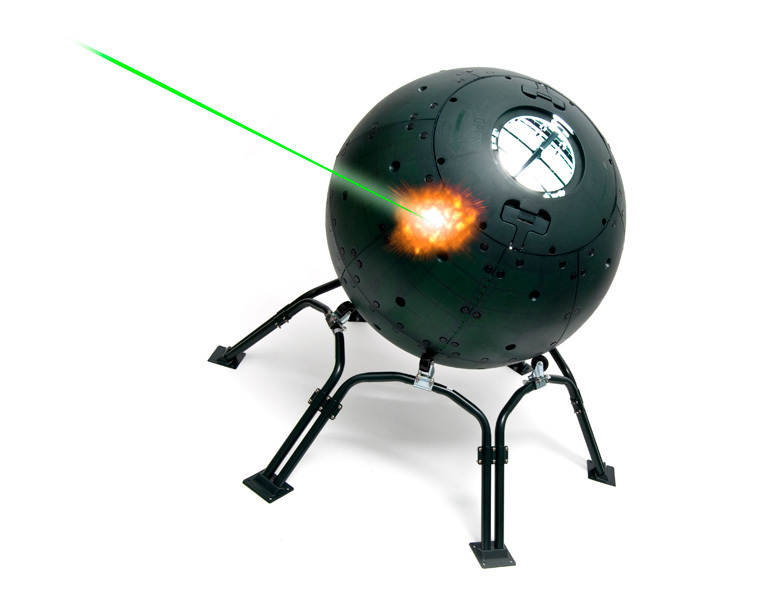 Today’s podcast on the site advertises a death star-esqe composter, and well, we got a little excited about that, and couldn’t help but put in an order! Here’s the full story: for nearly two years, I’ve been on the verge of starting some sort of composting pile. In fact, just yesterday, I was perusing this site for information on composting and vermicomposting (worms). It’s chalk full of great information from the NC Division of Pollution Prevention and Environmental Assistance. 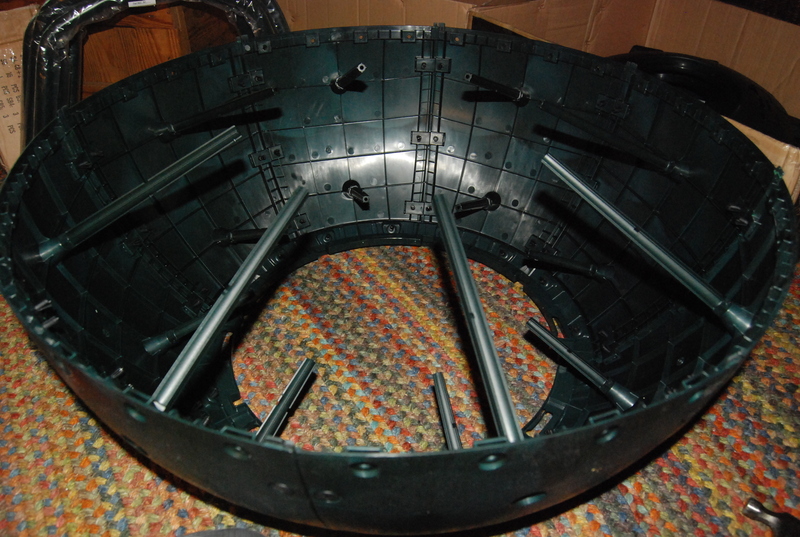 I even had a bin picked out for the vermicompost bin (which I may still start). I just needed to get worms, but where? And that’s when the project was just about to get pushed aside, just like last year when I only got as far as collecting pamphlets. The lesson here is that there are many, many ways to get started, so just do it. In our case, it took a death star. “The Death Star wasn’t built overnight!” responds my boyfriend. We are engineers. This is only a challenge to our skills. Check back for more, I’ll have a report once we get the thing into action! I’ve created a new category, it’s Green@Home. While not directly contributing to Duke’s carbon footprint, what I do at home has an impact on the world too, and all this thinking about sustainability in the work place tends to bleed over into thinking about life at home as well. In this new category, we’ll parse through what others are doing, and I’ll do some of them myself. Here’s to being green, at home! Today was the first day of the 2010 farm share season! For the past two years I have participated in a community supported agriculture (CSA) program. Every week, I get a box of vegetables that have been grown in North Carolina by the farmer I signed up with at the beginning of the season. Several of the participating farms drop off at locations around the triangle but I get mine at the Sarah P. Duke Gardens, a drop-off location organized through the benefits program of Duke employees. The program, though, is open to anyone. The idea is that you pay a flat rate at the beginning of the season, and get a weekly cut of the produce the farm harvests. Duke’s program has several farms to choose from at a range of price points and usually two or three share sizes. Farm shares are especially advantageous in a state like North Carolina which has a long growing season and a healthy agricultural tradition. We like it because we’re not only developing a relationship with the farmer, but we hardly have to think about vegetables all summer. Shopping lists get shorter and the volume of veggies in the diet goes up. We also get fruit, and that’s probably the best part. Well, I guess this means it’s probably time to break out the recipe book and get cooking!